This offer is good every time you spend $25, not just one time, until the end of the year. 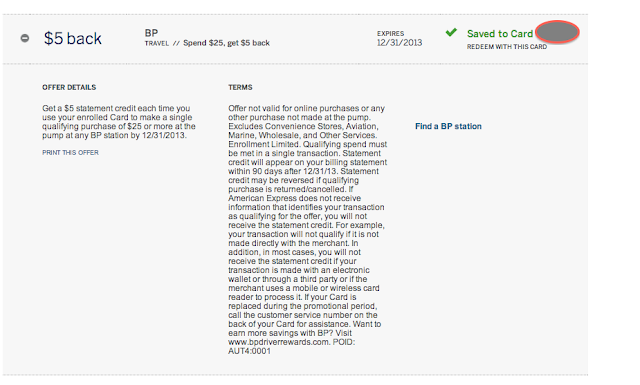 Check the "Offers for You" section in your online account and you might have an offer that you can click on that will automatically get you a $5 credit if you spend $25 at a BP station. That's 25% off. Alternatively, you can tweet #AmexBP from your Twitter account that is synced to an American Express card. You can confirm that you are qualified for the offer by clicking on @connect. I just got finished spending $30 at Exxon Mobil to get my $5 there so this is good timing. It's always nice to have American Express cards for these promotions, especially American Express cards that don't have annual fees that have access to the same promotions. The offer says it is for spending at the pump. I have not tried or read any confirmed reports of buying in the store ($25 gift cards would be 25% off gas until your gift cards run out).